Non-invasive ventilation (NIV) is the treatment of choice for patients symptomatic for respiratory muscle dysfunction. It can normalize gas exchange and provide up to continuous non-invasive ventilator support (CNVS) as an alternative to intubation and tracheotomy. It is usually provided via non-invasive facial interfaces or mouthpieces, but these can be uncomfortable and uncosmetic. The intermittent abdominal pressure ventilator (IAPV) has been used for diurnal ventilatory support since 1938 but has been off the market since about 1990. Now, however, with greater emphasis on non-invasive management, a new IAPV is available. A patient with chronic ventilatory insufficiency post-ischemic cervical myelopathy, dependent on sleep NVS since 2003, developed symptomatic daytime hypercapnia for which he also used diurnal NVS via nasal pillows. However, he preferred not having to use facial interfaces. When not using diurnal NVS he was becoming dyspnoeic. Diurnal use of an IAPV was introduced. Arterial blood gas analysis using the IAPV decreased his blood pH from 7.45 to 7.42, PaCO2 from 58 to 37 mmHg, and improved PaO2 from 62 to 92 mmHg. At discharge, the patient used the IAPV 8 h/day with improved mood and quality of life. Consequently, he returned to work as a painter. Non-invasive ventilation or “NIV” has come to refer to continuous positive airway pressure (CPAP) or bi-level PAP used at setting inadequate for full non-invasive ventilator support (NVS). However, non-invasive positive pressure ventilation is increasingly being used for continuous NVS (CNVS) as an alternative to tracheostomy mechanical ventilation (TMV) for patients with ventilatory pump failure. Over 1000 CNVS users have been described [1–4]. It improves gas exchange, symptoms , quality of life , decreases the incidence of pneumonia , and can be used to avert need for intubation and tracheotomy . Whereas tracheostomy tends to increase ventilator dependence, detracts from quality of life, and is associated with reactive depression, NIV/NVS facilitates ventilator weaning and extubation [9, 10]. It is delivered via facial interfaces including nasal, oronasal, nasal prongs, and mouthpieces for diurnal and sleep ventilatory assistance/support . However, the interfaces can cause skin discomfort and, at times, ulcerations, airway dryness and congestion and can impact negatively on quality of life and gas-exchange [11–13]. Moreover, oxyhemoglobin desaturations and dyspnea can occur with interface disconnection from NVS . The LUNA DS (Dima Italia Inc., Bologna, Italy) is a portable ventilator, that along with the PBAir™ corset is an easy to use IAPV. The LUNA has an internal battery capacity that can also be used for NVS for sleep. It provides a dedicated IAPV ventilation mode. The IAPV corset is lightweight (Fig. 1), comfortable, and easy to don and fit with Velcro fasteners. Like earlier IAPVs, cyclical inflation of a rubber bladder inside the corset moves the diaphragm upwards to expel air from residual volume. This causes air to enter the lungs via the upper airway as gravity draws the diaphragm back to its resting position. The IAPV eliminates need for facial ventilation interfaces. The following IAPV parameters can be set: PBelt™ (pressure inside the bladder), Tinsp (real inspiratory time when the diaphragm moves down), frequency (respiratory rate), and Rise Time (time to inflate the bladder). The IAPV only works efficiently when a patient is in sitting position at an angle of 30° or greater and is optimal at 75° . It optimizes cosmesis, facilitates social interaction and communication, leaves the field of vision free, and allows the patient a more normal sense of smell by eliminating facial interfaces that are colonized by often pathogenic bacteria, thereby favouring oral nutrition [15, 16]. A 51-year-old male painter with a 40 pack/years history of cigarette smoking and a diagnosis of chronic respiratory failure due to post ischemic cervical myelopathy was trained in bi-level PAP which he used up to 16 h per day since 2003 at 25 inspiratory cm H2O (IPAP) and 7 cm H2O expiratory (EPAP) pressures and rate 15/min. However, during the last year he experienced daytime dyspnoea, tachypnoea, orthopnea, and deterioration of gas exchange when not using it and complained of the interface causing discomfort and interfering with his daytime employment. His arterial blood gases (ABG) breathing unassisted in ambient air 4 h after discontinuing nocturnal bi-level PAP was PaO2 62 and PaCO2 58 mmHg. On admission, he was placed on IAPV ventilation. He wore the IAPV corset’s horizontal upper border two fingers below the costophrenic junction. His spontaneous tidal volumes of 172–180 ml increased to 771–908 ml using the IAPV with the LUNA ventilator set at 24 cm H2O pressure, rate 15/min (Table 1). Arterial blood gases were monitored after the second hour of IAPV use. Table 2 demonstrates normalization of the diurnal breathing pattern and gas exchange. After 3 months his PaO2 breathing unassisted in ambient air was 75 and PaCO2 44 mmHg (Table 2). Quality of life parameters were measured and at discharge thanks to the EuroQoL (EQ-5D)  and the World Health Organization Quality of Life Questionnaire (WHOQOL-Bref) , the patient used the IAPV 8 h/day with improved mood (assessed by the Hospital Anxiety and Depression Scale (HADS) ) and cognition (as assessed by the Mini Mental Status Examination  and the Addenbrooke’s Cognitive Examination Revised (ACE-R)  (Table 3). Moreover, three months later he reported that the IAPV was still effectively relieving his former daytime dyspnoea but that he had achieved up to 6 h/d of autonomous breathing without dyspnoea or tachypnea. C. J. McSweeney described the Bragg-Paul Pulsator, a IAPV that was used for 34 patients with acute diphtheritic respiratory muscle paralysis in 1938 [22–24]. The IAPV was perfected by Dr. Alvin Barach and his engineer William Smith in the 1940s . Until the 1990s it was used in combination with NVS modalities instead of tracheostomy mechanical ventilation (TMV). However, with the treatment paradigm shift to TMV in the 1960s, the IAPV went off the market and there have been no major publications of patients using it since 1991 . Now, however, with the paradigm shifting back to non-invasive management and over the last decade over 1500 750 CNVS users described [1–4], the IAPV is back on the European market [12, 13, 25, 26] and consideration of this practical, convenient, and comfortable daytime ventilation alternative is warranted. IAPV use had been limited by the relative lack of portability and inconvenience of formerly available large and heavy powerful ventilators needed to operate them, and the fact that clothing could catch on the corset buckles. Use of the IAPV had also never been reported by patients with cervical myelopathies. In our patient, the IAPV improved blood gases, relieved dyspnoea, and continued to be a comfortable alternative to bi-level PAP. 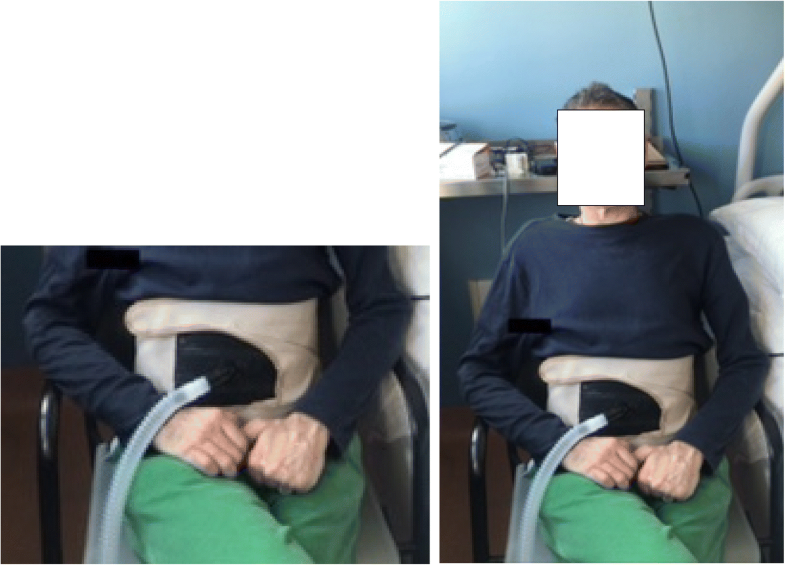 This case of IAPV use for ventilatory assistance for a patient with a post-ischemic cervical myelopathy suggests that it can be a safe and comfortable alternative to daytime NIV and TMV leading to a better quality of life for this patient population. We would like to thank Dima Italia S.r.l. for providing the LUNA DS device and to have performed PbAir corset. The authors declare that they have followed the protocols of their work centre on the publication of patient data. The authors have obtained the written informed consent of the patient mentioned in the article. The corresponding author is in possession of this document. BP contributed to the study design, VE contributed to the literature search, implementation and data collection of the case report as well as to the psychological assessments. JRB supervised and revised the manuscript, including the English language. All authors read and approved the final manuscript. The study protocol was submitted to the Ethics Committee of the Section "IRCCS Fondazione Don Carlo Gnocchi" IRCCS Regione Lombardia. Protection of human and animal subjects. The authors declare that the procedures followed were in accordance with the regulations of the relevant clinical research ethics committee and with those of the Code of Ethics of the World Medical Association (Declaration of Helsinki). The authors have obtained the written informed consent of the patient mentioned in the article. Bach JR Gonçalves MR, Hamdani I, Winck JC. Extubation of Patients With Neuromuscular Weakness: A New Management Paradigm, Chest 2010;137;1033–39; Prepublished online December 29, 2009. https://doi.org/10.1378/chest.09-2144.